Volunteers are a pillar of Australia’s history and culture - from the volunteers of the 1st Australian Imperial Force at Gallipoli, to the iconic surf-life saver at Bondi, and the conspicuous army of volunteers of the 2000 Sydney Olympics. Together, volunteers have played a large role in encouraging a particular idea of ourselves as Australians. One of the country's oldest and most prolific volunteer organisations is the Australian Red Cross Society. The Library’s large collection, the 'Australian Red Cross Society, New South Wales Division, photographs and scrapbooks, 1914-2014', documents 100 years of vibrant volunteer work in communities throughout New South Wales. Moreover, the collection reveals the personal stories, and in some cases the life stories, of the Society’s volunteers. By exploring the collection, it is possible to trace the trajectory through the ranks of notable Australian Red Cross Society volunteers. From its outset, the Society was driven by women who worked at high levels throughout the organisation. This was in part due to its founding during World War I (when many men were serving in the armed forces), but also due to a sense, perpetuated by its membership, that Red Cross volunteers were performing a ‘woman’s duty’. Regardless, through the Society women held positions of influence. Among them was Lady Persia Galleghan who, after joining in 1939, dedicated her life to the Red Cross, and spent almost 60 years as a volunteer. Photographs within the collection document Lady Galleghan’s life in the Red Cross, and show her as a social worker at Concord Repatriation Hospital, leading volunteers in marching drills at Victoria Barracks as Commandant, and assisting in the coordination of disaster relief efforts throughout the country. 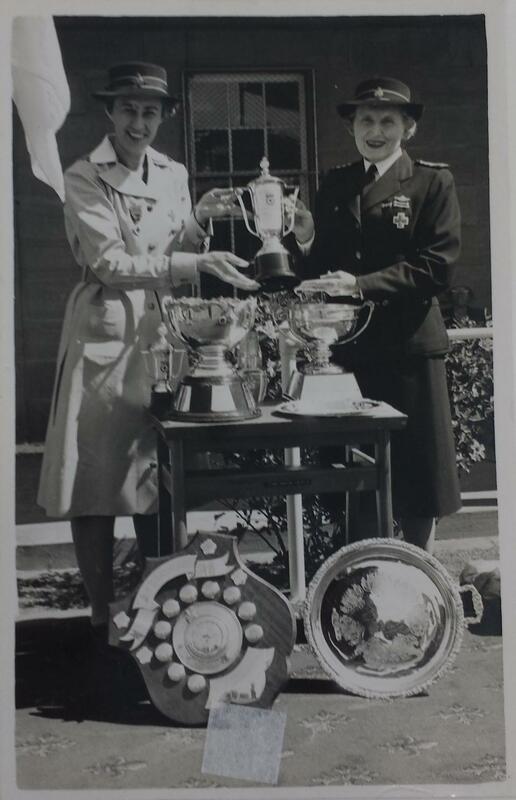 Lady Galleghan retired as New South Wales Divisional Commandant in 1982, not before being awarded an Order of the British Empire for her service in 1978. In addition, the collection documents the lifelong volunteering of Phyl Jenkins, Commandant of the Nepean Voluntary Aid Detachments, and ultimately New South Wales Director. Ms Jenkins enlisted as a junior member, and rose through the ranks to earn a Medal of the Order of Australia in 1977. Another long-term volunteer, Yvonne Kennedy, began as a VAD in 1976 and became NSW State Coordinator in 1991. Ms Kennedy organised first aid during rural bushfires and the Thredbo disaster. Tragically, Ms Kennedy was killed in the September 11 terrorist attacks in 2001, and within the collection is one of the last photographs taken of her, in New York, days before the attack. The collection captures the vibrancy and courage of volunteering communities that band together under the banner of the Red Cross. Within the collection are press photographs showing volunteers assisting after Cyclone Tracy (1974) and the floods at Kempsey (1942), Maitland (1949), and Nyngan (1990). In addition, amateur photographs show the aftermath of the Newcastle earthquakes (1989). Moreover, the collection reveals the camaraderie of the volunteers; shown at work during festivals, pageants, fundraising drives, and at various afternoon teas in the seemingly ubiquitous blonde-brick community hall. At charity barbeques, volunteers are shown hard at work, preparing food and tolerating celebrities, politicians, and even a cart-wheeling Humphrey B. Bear at Government House, as they quietly weave together the fabric of society. The work of the Red Cross Society during the two world wars is fairly well known, but this collection shines a light on its work in disaster relief and helping communities to re-build. The 'Australian Red Cross Society, New South Wales Division, photographs and scrapbooks, 1914-2014' is a collection that celebrates not only the history of one of the country's most significant charitable organisations, but also the role of the volunteers that formed and drove it. You can view the collection on the Library's online catalogue. Selected albums from the collection will be digitised and made available online in the future. Emma: A Novel. In three volumes.